I still remember the day we left, April 2, 2016. There’s a scene that will forever be stuck in my mind’s eye. It was just a few hours after I said goodbye to my pride and joy for the previous 8 years – the centerpiece of my life in California – my beloved BMW 325i. I couldn’t bear seeing it towed away on that chilly, foggy morning, but at least it was a donation going to a good cause. A couple of hours later, my wife and I grabbed our favorite donuts, our favorite coffee, and drove her car to one of our favorite places. 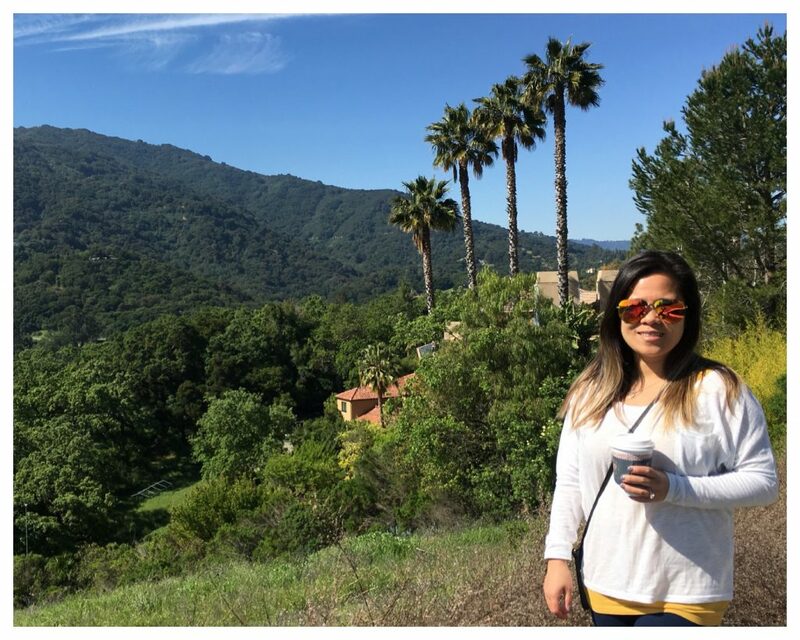 There we stood with coffees in-hand looking out over the beautiful, sunlit Saratoga (CA) foothills, dreaming about what life would like be the next day sun rose on us in a new city. We were leaving behind the beauty and comforts of California to explore and redefine our own meaning of the American Dream. Sure, we had achieved most of the comfort and stability that the American Dream portrays. We had established careers, lived in an amazing area with lots of friends and family, had a few toys, and we traveled extensively. But at the time, the idea of continuing along the traditional path (house, kids, purgatory, and then retirement – only kidding – sorta) just didn’t quite fit for us. So we decided to put a pause on that dream and, instead, use the power of our passports to create our own path to comfort and stability. Though it’s smaller than my footprint, my passport has the largest impact on my ability to step foot in many countries around the world. With a US passport, most countries allow me to hang around for 30, 60, or 90 days without any additional visas or paperwork (there are a couple of handfuls that even allow 6-12 month stays). Given the current state of affairs in the Divided States of America, it should be no surprise that the percentage of Americans seeking to venture abroad has risen sharply in recent years. Yet, still less than half of all of my fellow countrymen (and women) actually possess a passport (42% as of late 2017). Over these last 3 years of nomadic travel, we’ve left footprints in about 11-12 countries on average each year. Our longest, most comfortable stays have been in Spain and Thailand, which have become more like seasonal homes for us. It just so happens that during this same time, Thailand has experienced a significant tourism boom. So much so that recently the Thailand Tourism Board has projected 40+ million tourists to visit the country in 2019. That’s about 60% of the entire country’s population! It’s no wonder that they are finding ways to limit the influx and balance the increases in revenue and popularity with the typical downsides that result from such a dramatic foreign invasion. Arriving in Thailand this past August (about a month earlier than expected) with only a 30-day visa with our passports, we devised the seasonal strategy for our 6-month stay. It would be a delicate dance between 30-day entries, 30-day extensions, and 3 carefully planned “visa runs.” With all the travels throughout the year and our previous two long-term stays in Southeast Asia, we resigned to run to spots of comfort rather than exploration. Each of our 4-5 days trips this season were to cities we’ve enjoyed in the past. And while the trips all went well, my last entry into Thailand would serve as a wake-up call that our strategy for next season would have to change. 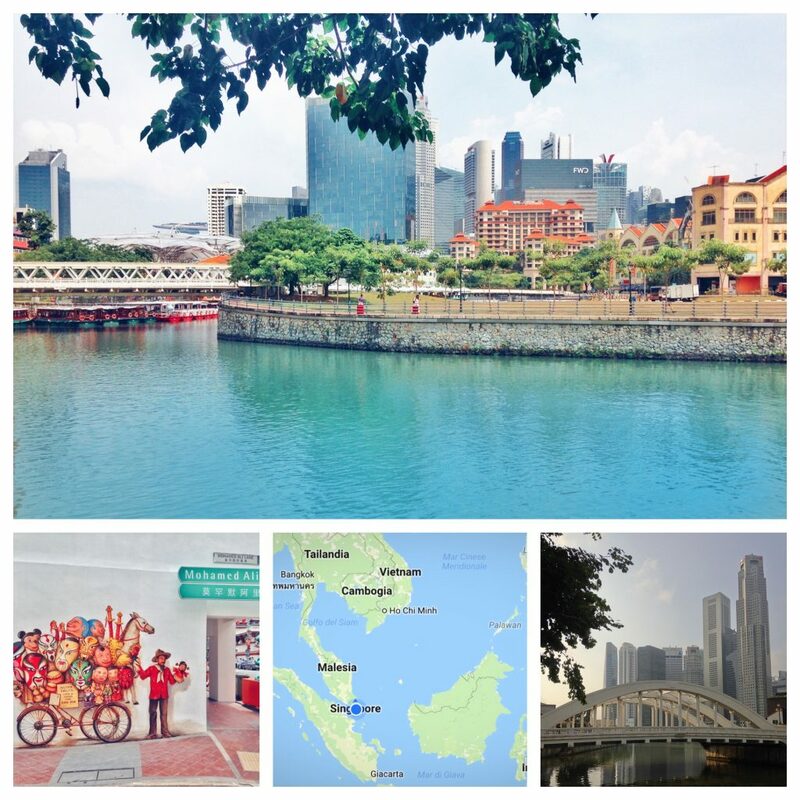 Our trip to Singapore was planned soon after we received our first 30-day extension in early September. Spoiled by the efficiency and comfort of Taipei and previously frustrated by the lack thereof in Da Nang, Vietnam, a quick 3-hour direct flight to one of Southeast Asia’s most developed cities was a perfect choice for our first visa run. Yet, it wasn’t until I decided to send a random email that it turned into a business trip. The day before our flight, a person popped in my mind as I was going through my typical morning email catch-ups. The previous year, I published a white paper in a major Human Resources Management publication in partnership with one of my clients at Stanford Children’s Health. Shortly after the paper was published, I followed up with one of the editors (Alison) who happened to be located in Singapore. We made it a point to connect for coffee if either of us ever ended up in the same city somewhere in Asia. Lo and behold, I was on my way to Singapore and so I sent the email. From that email emerged a thread that included me receiving a request to bid on a marketing communications project for Alison’s firm in Singapore to us meeting for coffee to discuss writing, life in Southeast Asia, and the consulting opportunity she proposed. 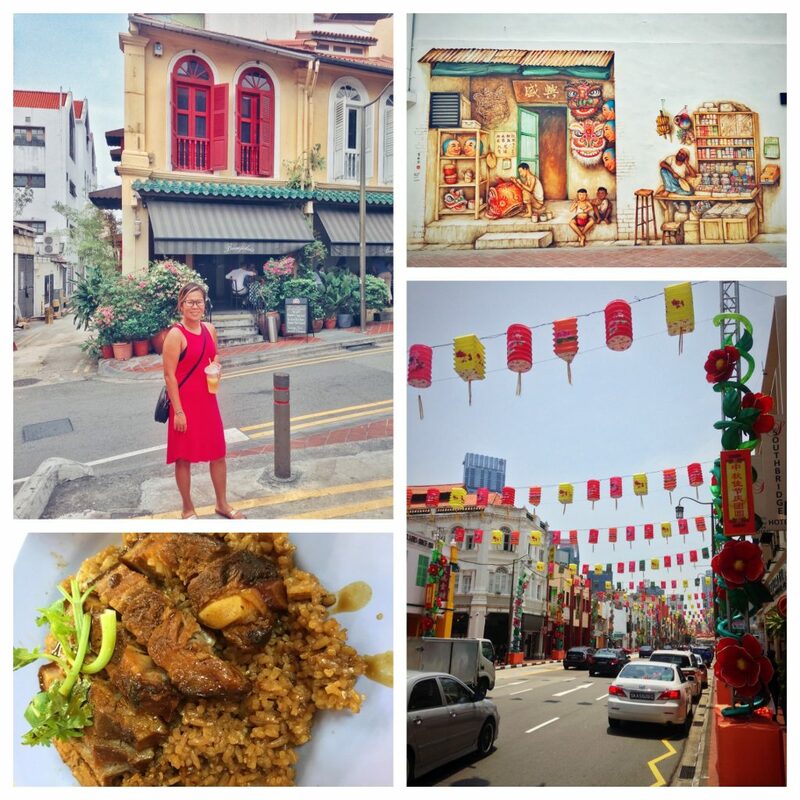 What began as a simple visa run getaway to Singapore soon turned into a business trip and a dream come true. When I decided to take my consulting business full-time in March 2011, I dreamed of the opportunity to work with international clients. 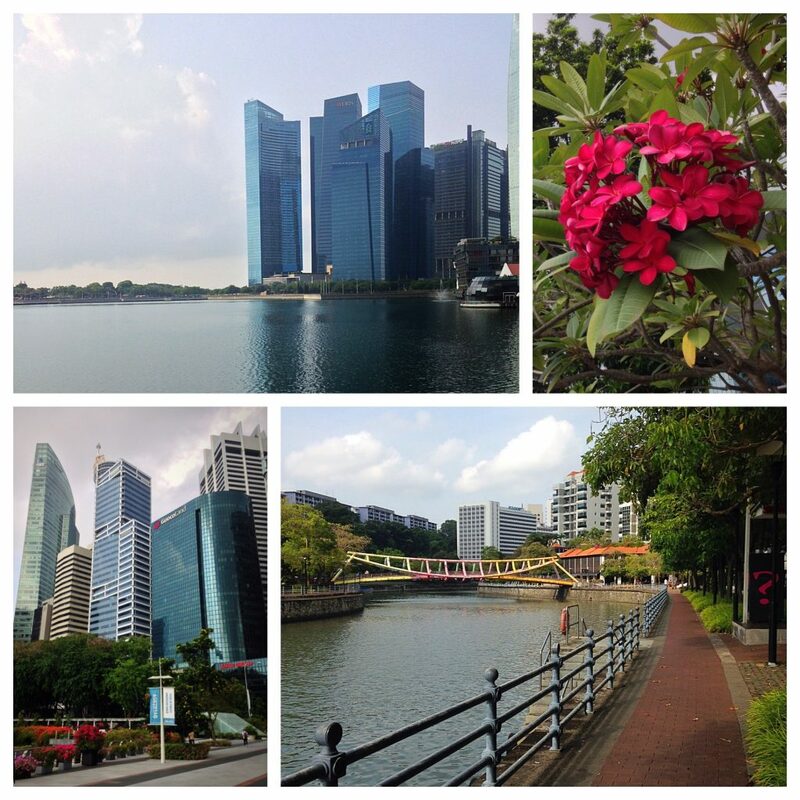 Now, here I was 7 years later negotiating with a potential client in Singapore – one of the top business cities in Southeast Asia. 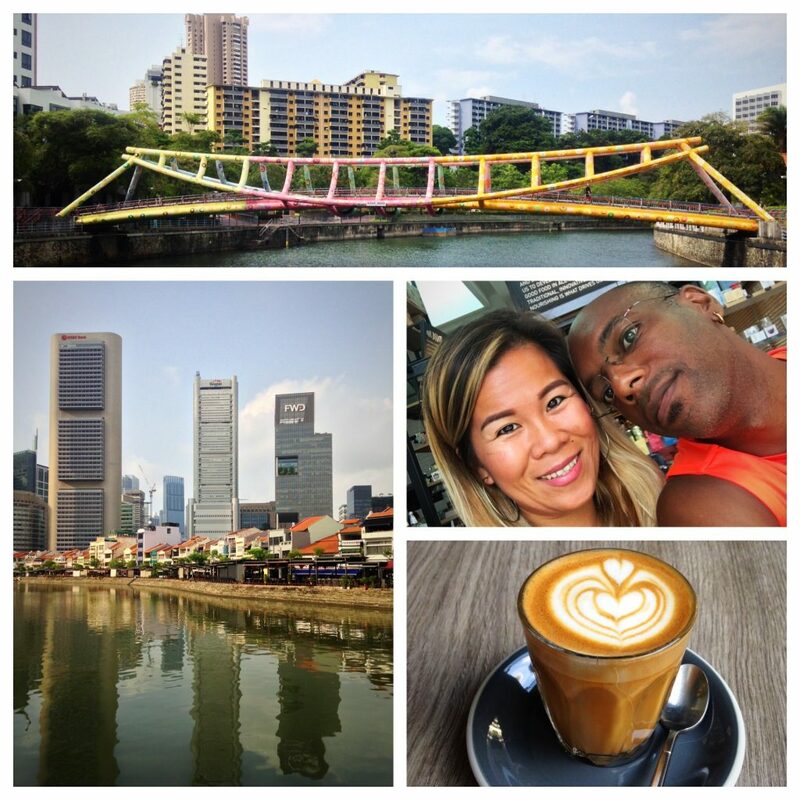 While the business matters were bouncing between emails and proposal revisions, my wife and I enjoyed the simple, efficient pleasures of Singapore. Two years earlier, we explored much of the city and its sites, and so this time we simply wanted to hit a couple of new spots and rekindle memories from our previous trip. 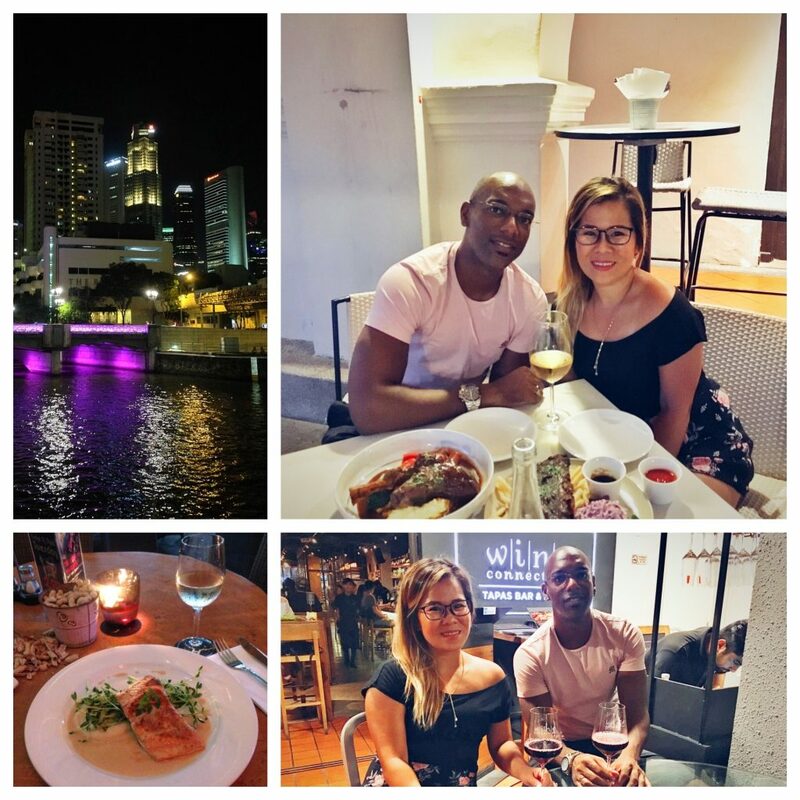 Staying along Clarke Quay, in the heart of the city, made it easy for us to enjoy nice walks along the Singapore River in the morning, comforting cafes and hawker stall snacks around the city during the day, as well as amazing cuisines and drinks accompanied with live music in the evenings. After all of the bouncing around during the previous summer months, there was something so relaxing about the feeling of being “home” in a place so far away. We couldn’t have asked for a better place to celebrate our fourth wedding anniversary. The day before our departure, Alison and I concluded that we were simply too far apart in our negotiations. It would have been a great opportunity for me to expand my business and potentially create a new market for my services, yet the realities of foreign exchange economics were too great. Essentially, we were off by about 40%, which was almost exactly the difference between doing the project at my rate in USD versus SGD. In the end, we decided that it wasn’t the right opportunity at the time, but perhaps we might meet again in the future should another opportunity present itself. Ironically, upon my arrival back into Chiang Mai, I received a ping from one of my clients at Stanford Children’s Health in California. They requested my services for a similar project and we quickly agreed on a rate. It was for nearly the same fee that was turned down in Singapore. The realities of foreign exchange economics quickly turned around in my favor. Just 26 days later, we were in the air again – this time headed back to Malaysia’s second city for the second time and for our second visa run of the season. 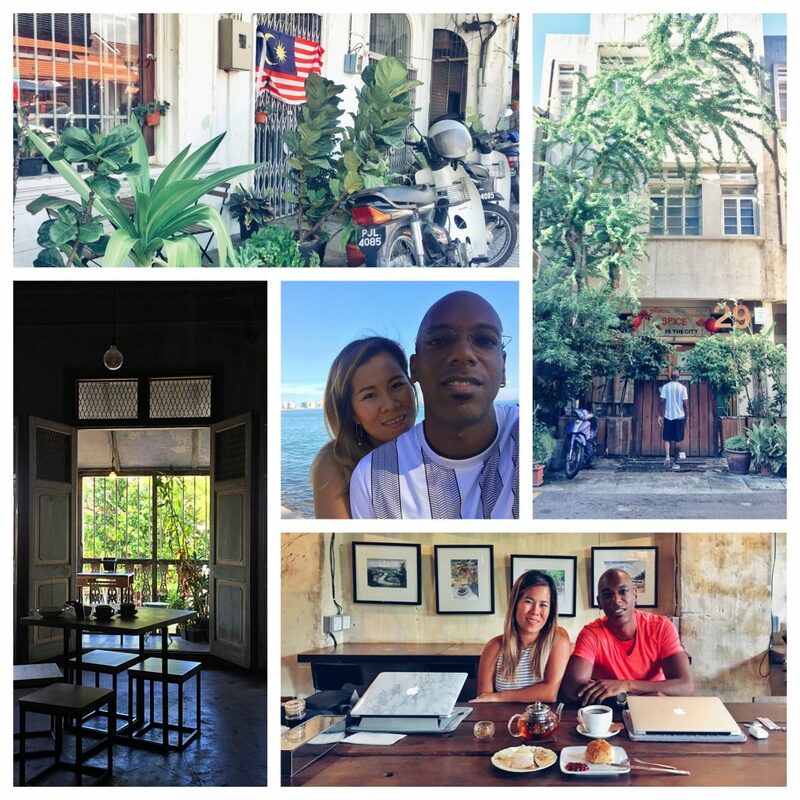 We first visited Georgetown, Penang back in January 2017 with my cousin Angie and explored it as a potential Southeast Asia “home base” secondary to Chiang Mai. That first time it didn’t quite feel right as a good alternative and so we were excited to revisit and see if things had changed. And though I wasn’t able to make it into a business trip, it eventually became a trip to celebrate a major business milestone. Less than 2 hours after we arrived, we were quickly reminded how much we enjoy our time in Malaysia. Tired and hungry, we lucked upon a seaside hawker complex just steps away from our high-rise AirBnb apartment on the north side of the island. 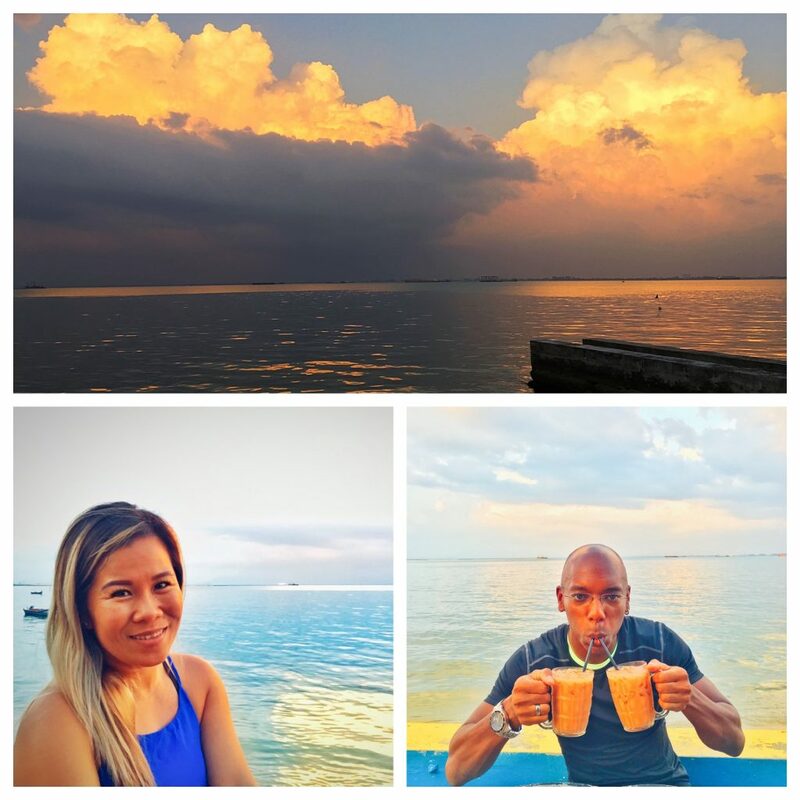 The sunset, the biryani rice dish, and the tea tarik (milk tea), were the perfect combination to calm the appetite, soothe the soul, and welcome our minds and mouths back to Malaysia. 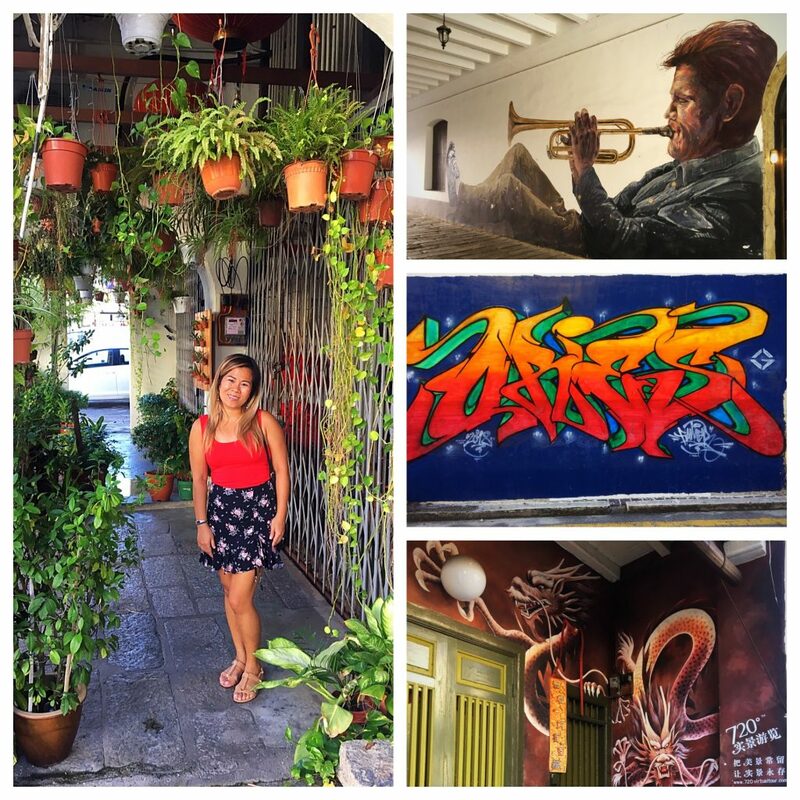 The next couple of days, in between the heat and the random rain showers, we explored the Old Town, the café scene, the amazing street art, and the coastline. We were trying to see if things had changed enough to make us feel like it would be a getaway spot during Chiang Mai’s February – April burning season. While there are many things we love about Penang – the food, the street art, and the coastline – it’s simply not enough for us to deal with the limited and decentralized café scene, the traffic congestion on the small island, and the lack of shade and sidewalks in key areas to enjoy nice, urban walks. 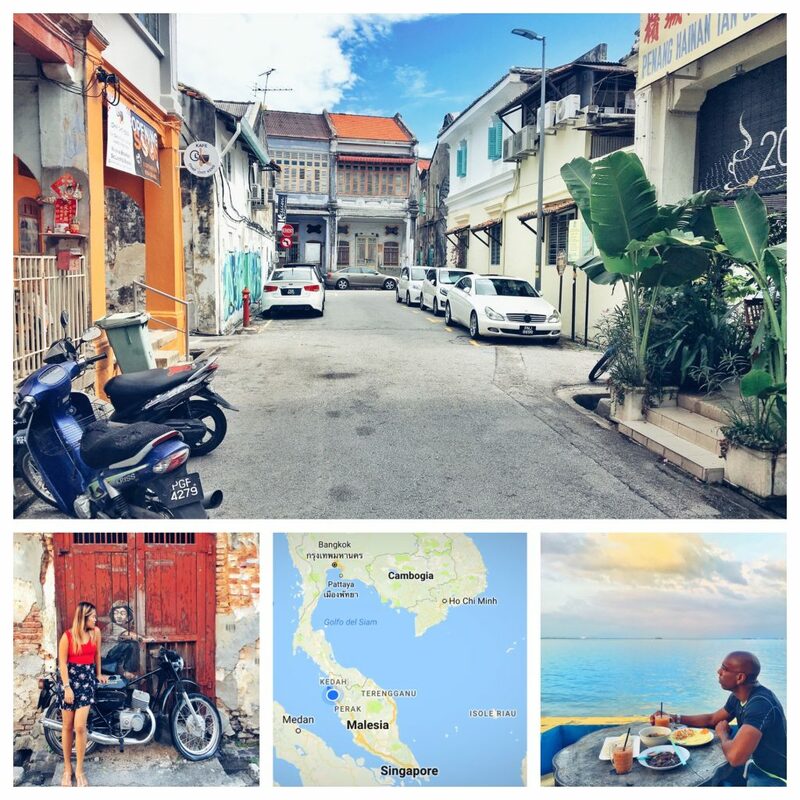 This is not to say that Penang is not a good place to travel – it’s awesome for a short stay. However, as long-term nomadic travelers, we evaluate places for month-long stays differently than those for short getaways. It’s about settling in places where we can quickly design the comfort and stability that keeps us engaged and productive. This is not a comparison or binary choice between places. It’s simply about finding the right personal fit. Each person is different. What appeals to them and what keeps them engaged and productive is different. During our previous month in Chiang Mai, my wife hit a productive stride in one of her business ventures, and days before our trip she received an offer she couldn’t pass up. It was her first major sale – a small boutique online store that she started as a side project earlier in the year. In celebration of her accomplishment, I surprised her with a Friday night out on the town. Needless to say, the meal did not disappoint – it was surprisingly amazing. 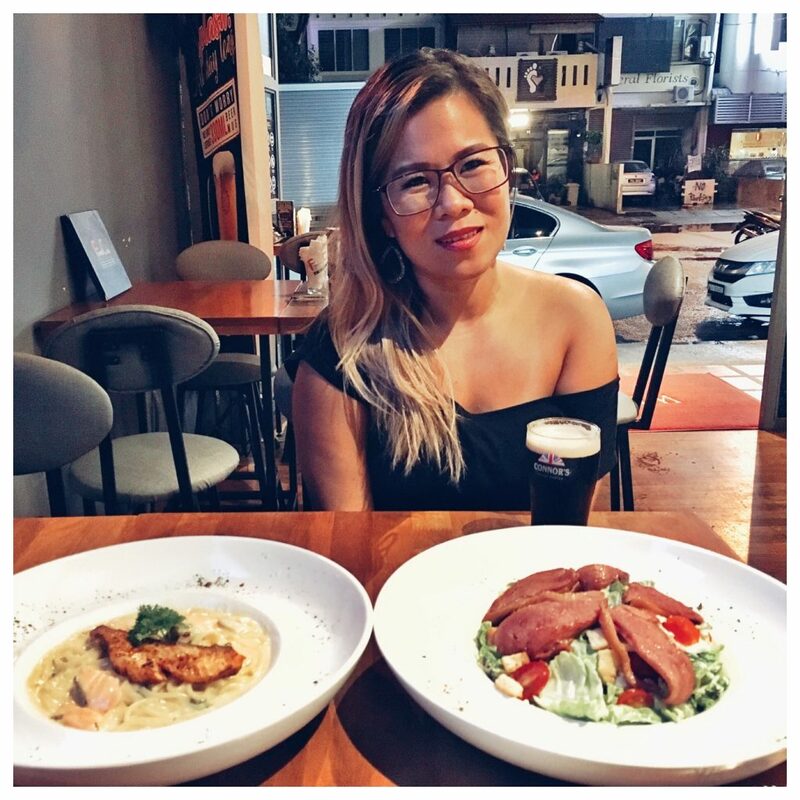 Food is our primary pleasure in Penang, and so it was fitting to commemorate her achievement and our brief stay in such a way. Visa runs are always a delicate dance between price, time, comfort, and fun. Sometimes one of those variables takes precedence over all others. 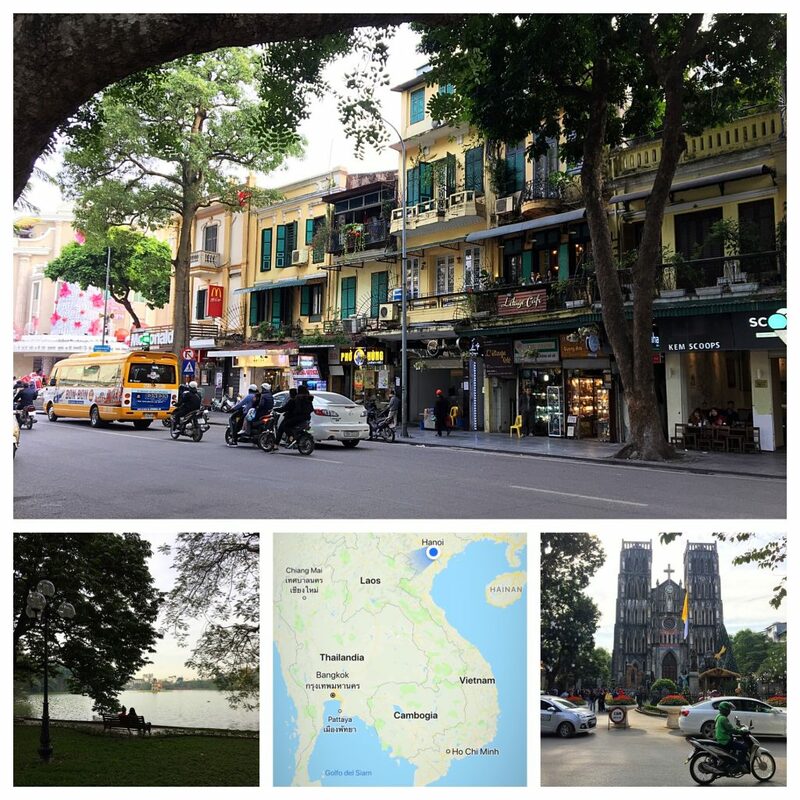 In our case, the final visa run to Hanoi was mostly about time. 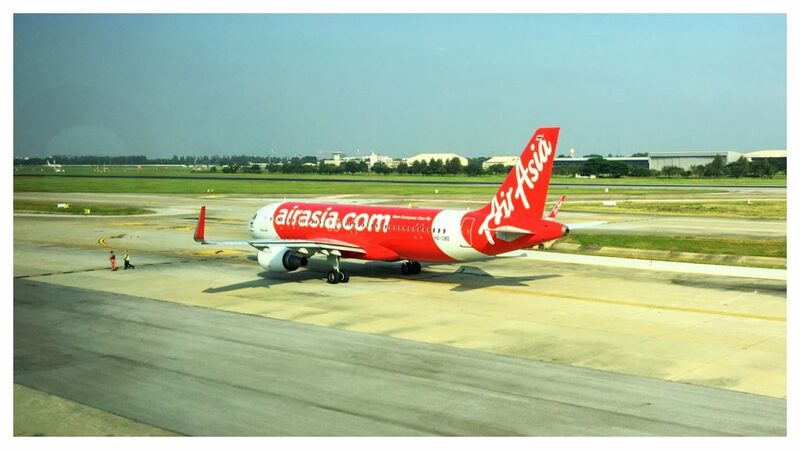 Air Asia had just begun promoting a direct flight from Chiang Mai to Hanoi, when we took our trip down to Penang. A short 1.5 hour flight to Hanoi seemed better than all other options for a final visa run that we had to take but weren’t necessarily excited about 60 days later. For those that know me well, know that I have a love/hate relationship with Vietnam. 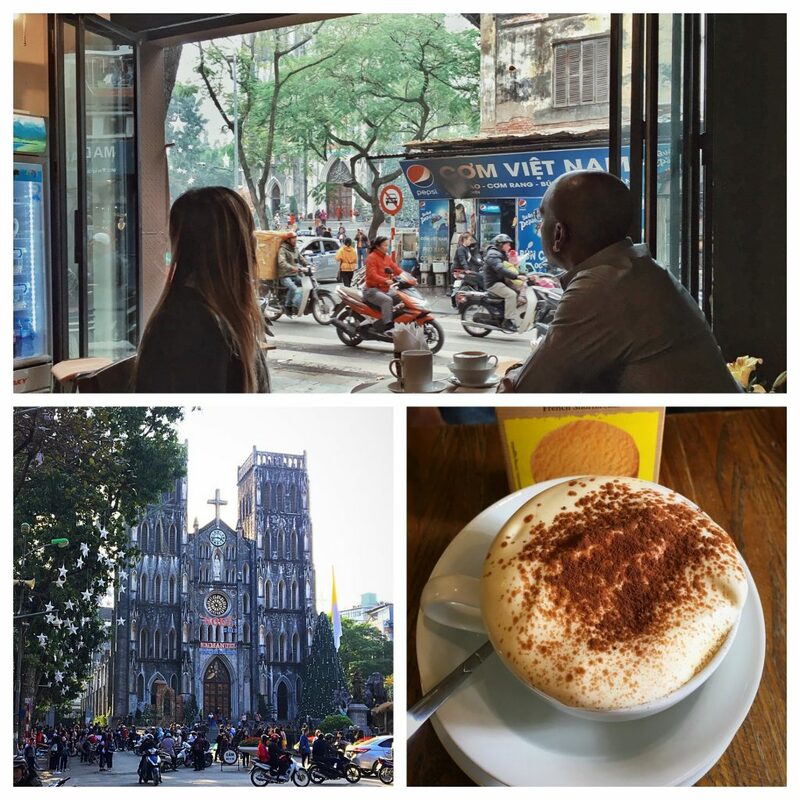 I love the food and café scene, learning the language, and, in Hanoi, I love the scenery. Yet, the abrasive shift in culture from the “Land of Smiles” (Northern Thailand) to Vietnam can be quite jolting. Little did we know that we’d also have to deal with a couple of days of wintry weather and little to no sun during our entire 5 days in the Vietnamese capital. Was it clouds, smog, or fog – who knows? It was simply gray and cold. So cold that I was forced to buy a skull cap to wear walking around the city and even to sleep at night with multiple layers of clothing, given that our apartment didn’t have any heat. (Why would you have heat in an apartment in Southeast Asia?) 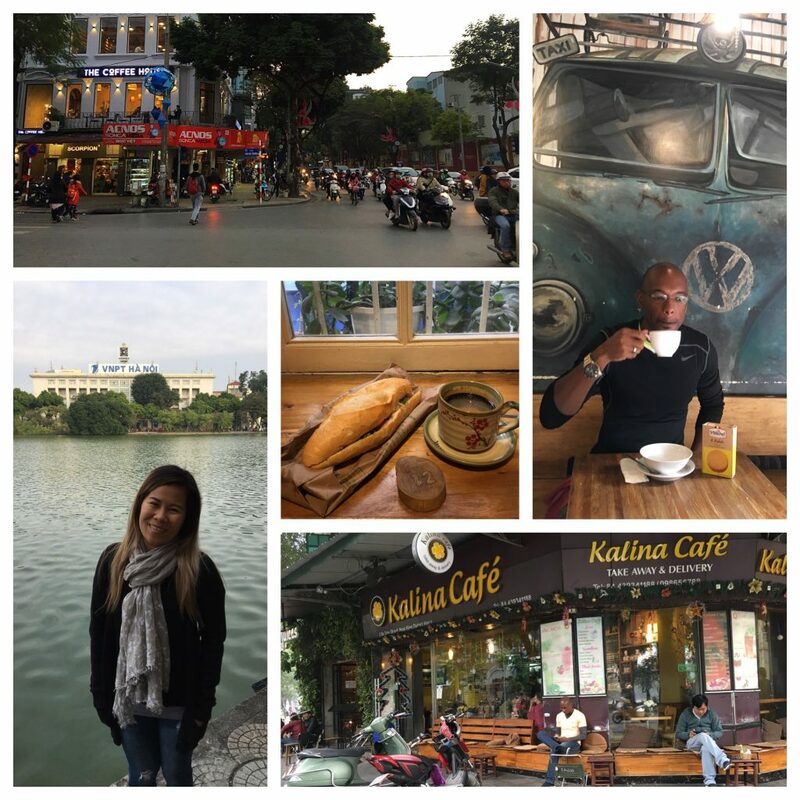 But for as much as the cold and gray dulled our energy, the food, cafes, and lakeside scenes of central Hanoi captivated our senses. The day before departing, we took a moment to take in the beautiful French-inspired Old Cathedral and plot our travel plans for the upcoming year. Sipping egg coffee at a sidewalk café while peering towards a taste of Europe was a fitting symbol of our impending annual jaunt around the globe. In those little moments we often recognize how lucky we are to possess the freedom that our passports provide. Yet that freedom soon came into question upon our arrival back into Chiang Mai for our final 30-day stay. There are always feelings of comfort when arriving in Chiang Mai but this final time was different. We had just spent 5 days in Hanoi, shivering constantly under a blanket of smog and fog. As soon as I exited the plane on the tarmac and felt the sunshine and warmth of 30 degrees Celsius, I knew I was back “home.” But when I saw the immigration officer lean back in his chair while flipping through my passport and shaking his head, that feeling quickly faded. His tone, demeanor, and questioning soon gave me a feeling that I had never felt during my numerous entries into Thailand. According to him, I had been “in/out too many times.” So instead of stamping me in, knowing that I already had an exit ticket purchased to Vietnam in 30 days and that I wasn’t planning to return until 7 months later, he instructed me to go sit in the blue chairs adjacent to the immigration line and wait for a formal officer. I wasn’t too concerned given that my wife had already been stamped in, I already had a ticket purchased to leave in 30 days, have medical insurance, enough money in my bank accounts, and a business that operates outside of Thailand. So when the formal immigration officer came over to question me, I was pretty relaxed and even smiling. Perhaps my demeanor played a part in her also being relaxed with me, such that she eventually told me that I must have been flagged in the system for going “in and out 6 times within the last 12 months.” After a little paperwork and clearing matters up, she waved me through the shorter immigration line and advised that it would be best to enter on a 2-month visa prior to our planned return in September. This was the first time my feeling of comfort and stability was shaken during my visits to Thailand. It’s understandable given the dramatic rise in tourism in recent years and the country’s desire to limit the amount of foreigners staying in the country for more than 6 months each year. Ironically, as we depart Thailand this season for the final time, we recognize that 5 months is about our personal limit of time here. Yet, we are still in need of identifying a comfortable alternative in Southeast Asia for the late winter period before our annual springtime arrival into Spain. Each of the visa runs this past season served their purpose but none rose to become such a destination. At the very least, we have time and the freedom of our passports to explore other spots around the globe before returning in the fall to face the strategic randomness of routine visa runs.